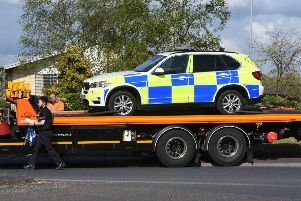 A prolific car thief from Peterborough who is believed to have committed 200 offences said he will admit to all his crimes to save taxpayer money. Serial offender Paul Priestley, who admitted two vehicle thefts this afternoon (February 9), has been going around the city with police officers to help them identify the exact number of thefts he was involved in. Priestley told Peterborough Magistrates’ Court today that if he did not cooperate with the police it was “just going to cost the taxpayers money” by delaying the process. The court had earlier heard from prosecutor Bob Rowlingson that an officer he had spoken to “expects somewhere in the region of 200 offences” to be taken into consideration (TICs) when the hearing takes place on February 23. Priestley also pleaded guilty today to an attempted theft from a motor vehicle, vehicle interference, failing to comply with the requirements of a post-custodial sentence and the breach of a Criminal Behaviour Order (CBO). The 39-year-old from Bringhurst, Orton Goldhay, has previously been described as a one-man crime wave. During a hearing last year he said he would be “back in court in six months” because he was unable to pay compensation to his victims after being jailed for a string of car thefts. The court heard today that Priestly stole £5 in loose change from a Volkswagen parked on a driveway on September 20, 2017 and was identified after being caught on CCTV. The vehicle interference charge related to October 17 last year. The victim had left his BMW and Fiat Ducato van securely parked in his driveway at the front of his property. Alarms went off at 3.15am and CCTV showed Priestley running away. On October 28, Mr Rowlingson said: “In the early hours of the morning a person entered the van and conducted a search before leaving empty-handed. And on January 13 this year Priestley stole gilets and memory sticks worth £230 from a vehicle at around 4am. The breach of the post-custodial sentence related to missing appointments after being released from prison following a sentencing for motor vehicles. Deputy district judge Davies adjourned the case until February 23 to allow the police time to compile a list of all the TICs. She said she could not promise whether sentencing will take place on that day, with no decision made yet on whether to sentence Priestley at the magistrates court or a crown court. Until that time he will be remanded in custody.